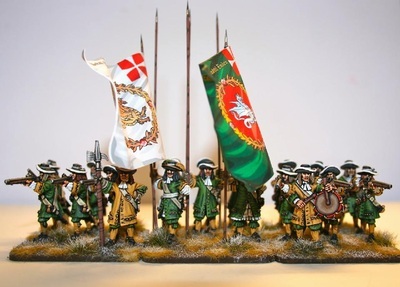 I put here picture of the same unit (the Danish Fynske Regiment at the Battle of Lund on 4th December 1676 in two different versions. On the top page there is allegedly 1 battalion of this Regiment while the other picture shows the same battalion with papersoldiers. The first picture is taken from the site of Black Powder Games. 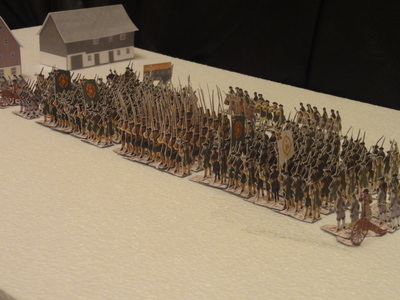 This unit (on the top) is composed of 12 musketeers, 4 pikemen (of whom 1 Officer), 2 colours, 1 NCO and 1 drummer for a total of 20 men representing about 320 men, meaning 1 figure represents 16 real men. This is actually already a very good proportion. Nonetheless I do believe that it lacks of realism. It is in fact impossible to reproduce the 2 guns on the flank of the unit tht were extremely important during the battles of that period, while the colours represent 10% of the men (!). Obviously no doubt about the beauty of every single figure that is a real masterwork of painting. The problem is whether the player wants to use a stand with some figures to represent a unit disregarding its real composition and deciding all with dies or prefers a more realistic representation of a single battalion even if the single figures are not that good. 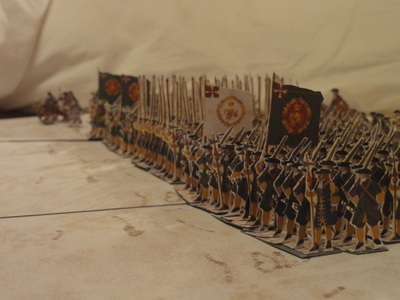 It is also worthy to say that the papersoldiers make their effect on the sight when they are together reforming exactly the visual impact an army had during the battle. The problem is that a vert big battlefield is needed to display all the unit. 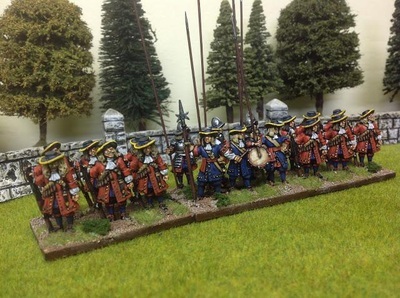 By the wat the Battle of Lund in 1676 is a phantastic opportunity of recreating at a ratio 1:1 a battle, considering that the unit were arrayed on 6 ranks and the total numer was very reduced. 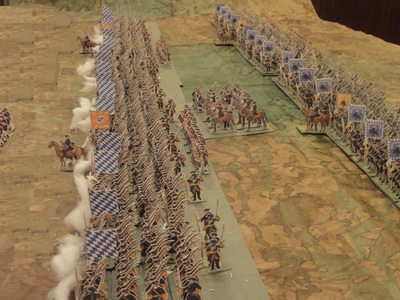 At the contrary, it will be impossible to recreate the entire battle of Borodino for instance, both because you need more than 200.000 paperfigures both because the needed space would be enormous. Perhaps in this case a reduction scale would fit. In the pictures above, I just wanted to compare again the visual effect of a battallion of the same period, not to critize one or the other, but to permit a free choice. It is evident that the first big differnce consists in the number of figure. On the left 317 papersoldiers; on the right 18 metal figures. As a visual fact the right one is much more charming the in the single uniform, very detailled but the total vision is quite poor. More as a battallion it seen a group of friend gathered for a fun day outside. 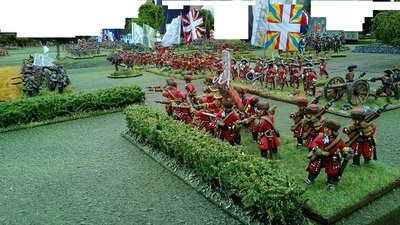 On the left (obviously I do support my papersoldiers) the large number of figures allows the player to come down to the details of a battallion, representing the fifers, the regimental guns, the grenadiers, the sappers, the pikemen, the NCO giving a real taste of what was a real unit in those glory days. These photos perfectly represent the difference between a battle reproduced by nomal figures and a battle reproduced by papersoldiers. It is a real conceptual different vision of wargaming. With normal figures, every stand actually just represents an idea of troops disregarding the real number of soldiers, while with papersoldiers the real composition of an unit becomes the most important thing to solve a fighting exactly as in real. yes, I agree... do you cut and print your own papersoldiers? Brilliant blog. i love paper soldiers. See my attempts here also. Very impressive work you have made. Do you dsign your own soldiers ? Thank you. yes I design them by myself. 1757 SYW - PRUSSIAN 8th REGIMENT "VON GEIST"